So how do you trace the route of a drain deep underground? With a CAT and a ‘ferret-finder’ of course! The ‘ferret-finder’ is a device that screws onto the end of a drain rod, and emits a signal picked up by the CAT. This is slid along the drain until a blockage is found. Ray here with the CAT (Cable Avoiding Tool) which acts like a metal detector. He sweeps it over the ground and it gives a loud beep when it locates the 'ferret-finder'. Roland then slowly inserts the drain rods with the ‘ferret-finder’ on the end into the blocked drain. X (or an arrow!) marks the spot. Here is the blockage so we know where to dig. No animals were actually needed for this task but 50 drain rods were! Look out for more Secrets of the Ranger! A little can mean a lot….. This month the Windermere rangers have been busy working on a small project which will make a big difference to so many walkers. Post Knott is a pretty field with a rock outcrop that looks over Bowness and Lake Windermere. It has a well used path through it which is wide and gentle until….you reach a tall wooden ladder stile. The offending stile. Easy for some to pass over, but difficult for many others. With permission of the neighbour we set about taking this ‘dog stopper’ down and replacing it with a kissing gate. This will allow those walkers with less mobility, walkers with push-chairs and dogs to pass through with great ease and safety. Now over to the visitors of Post Knott and your comments on our work here…. No guesswork was used as this was built to British Standards! (BS5709 to be exact). Roland, one of the Windermere rangers is building a new quoin end to the wall. No more nails. Care and precision, and a dry spell in the weather was used to build the wooden pen. The finished kissing gate with Brantfell in the background. Walkers and their 4-legged friends enjoying the new gate. Post Knott is South East of Bowness on the way up to Brantfell, just a short detour from the start of the Dales Way long distance footpath. It is a quiet, dog friendly location with great views over Lake Windermere and a perfect place to take a picnic and unwind with nothing but the sound of crickets on a sunny afternoon. Working holidays have been going since 1967 and make a real contribution in engaging supporters, environmental understanding, conservation activities, budget savings and meeting our mission. Participants join interesting activities, learn new skills, have new experiences and provide thousands of work hours. Groups are over 18 years old, up to 12 people and have a volunteer leader and assistant. They stay in bunkhouses or cottages and cook good meals. 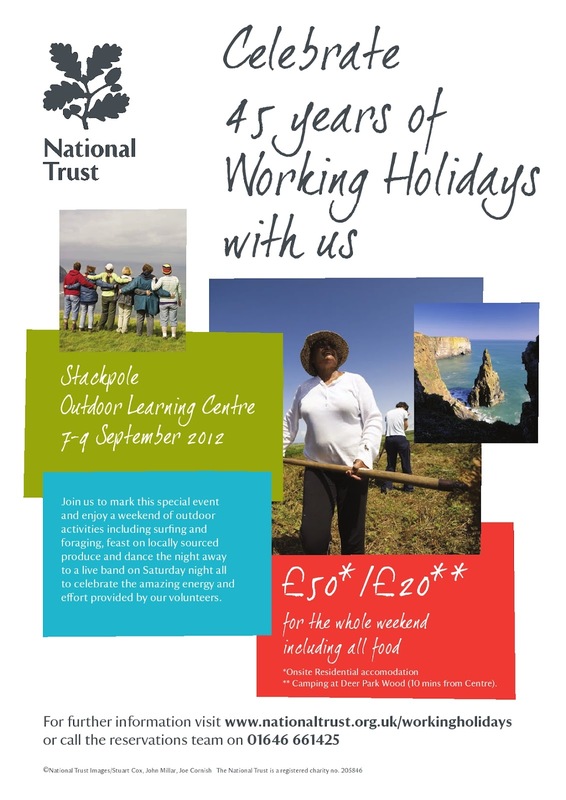 16 to 18 year olds can do Youth Discovery working holidays and their Duke of Edinburgh’s award. Working holiday activities range from hedge laying to charcoal making, walled gardening to cider making, moorland surveys to conserving collections, winter crafts to John Muir discovery awards. Many combine these activities with leisure activities such as photography or surfing. Working closely with properties and locations, the holiday’s team help to develop and assist a programme of week holidays and short breaks across England, Wales and Northern Ireland. On the 29th of June 4 more of the giant hogweed plants were found at ferry nab. A specimen was found just 3 yards away from National Trust land. Only one had produced the flower head which made it easy to find in the undergrowth. Look at the height of it! On closer inspection 3 more were found, and promptly dug up. I have since been informed that the seeds from this plant may remain viable for 15 or even up to 25 years! If you see this plant, keep well away from it as its toxic sap can cause serious injury. Please contact the landowner, if known, or the appropriate authority.